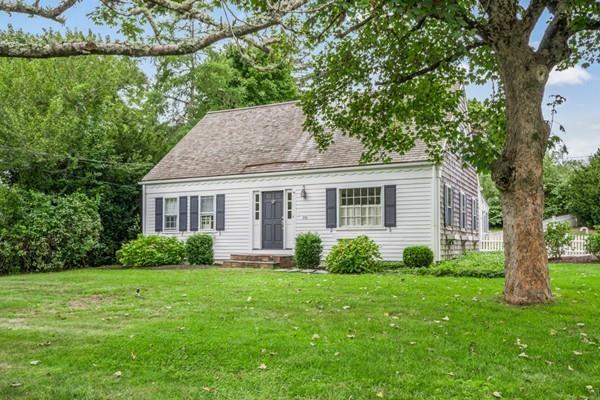 The quintessential Cape Cod home, replete with white picket fence and picturesque grounds. The interior offers a newly renovated kitchen with quartzite counter's and stainless appliances. The sun filled living room has a cozy fireplace and hardwood floors. Step down the hall to a first floor master bedroom , newly renovated full bathroom, and den. The 2nd floor offers two large bedrooms and a brand new full bath. Step outside to the large screened in dining area, overlooking the patio perfect for hosting your next barbecue. Outdoor shower, gas heating and enclosed recreation room ...just to name a few. Walk or bike to historic country store,library and beaches. A delight to show!. Please verify all information contained herein. Listing courtesy of Janet Curtis of Coldwell Banker Residential Brokerage - Milton - Adams St.. Disclosures 1 Car Garage Was Converted into A Recreation Room. Listing provided courtesy of Janet Curtis of Coldwell Banker Residential Brokerage - Milton - Adams St..